Okay, so up for review is the Epson Workforce 600 all-in-one printer. Paul helped me review this product since I couldn't physically review it, I had him lend me his hands and just fed him instructions through email. 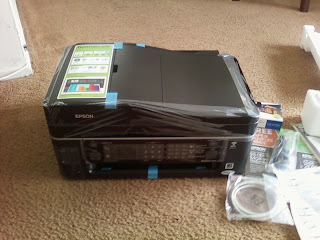 So first off, thanks to Paul and second, thanks to Epson for giving us the chance to review this product. Anyways, according to Paul, the first time the Epson WorkForce 600 arrived in the mail, his first reaction was--"whoa, this thing's huge". He had trouble making it fit in his desk so he had to move things around. Though the Workforce 600 is massive, the design is pretty sleek. It has a 2.5 inch LCD in front so you can do some fast printing and copying without booting up your PC. My previous all-in-one printer from HP was white and after one year, it's now a grayish white even if I regularly dust it. The black color suits those who, like me, don't have time to clean up their printers. I have to make this review short and quick so let's get down to the important details. First off, the Epson WorkForce 600 already has a built-in WiFi. In fact, I think Epson specifically made the WorkForce 600 to be used on WiFi networks since they didn't include a USB cable. 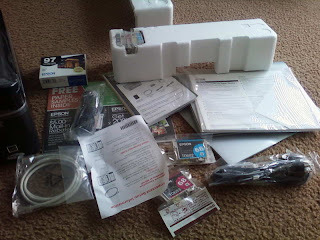 You have to connect the Ethernet cable with your wireless network but set-up is basically a breeze, according to Paul, you just have to follow the step by step instructions. For those who still don't have a wireless network, you have to buy a separate USB cable in order to set this up but USB cables come pretty cheap, I'm just wondering why Epson didn't feel the need to include it.One of the features that Paul liked best about the Epson WorkForce 600 is that you can already view your pictures from the SD card directly on the LCD screen. And for those who'll ask if the Epson WorkForce 600 has the ability to print directly on CDs, sadly, no. One of the most important feature that printer buyers look for when buying printers is: printing speed. Here's the print speeds of the Epson WorkForce 600 as well as pictures of the sample printout.All I have to say is that some printer manufacturers tend to exaggerate when bragging about their print speeds. Epson's claims versus the actual print speed is pretty close which, I have to say is pretty amazing. Print speed for photos using Epson's Premium Photo Paper – 2 mins and 15 seconds. Aside from the Epson WorkForce 600 being a very fast printer, Paul wants to add that he really liked the fact that the ink dries quickly on this printer so you'll be able to get laser quality documents on an inkjet printer less the smudge. Also, he wants to add that like me, he likes the fact that the Epson WorkForce 600 is black in color so there's less stain visibility. All I can say is that for $199.99, this is probably one of the best printers in this price range. Not only does it have good print quality but it's also fast as well. Kudos to Epson for being truthful about their product claims, I was surprised that the pages per minute of the black documents only showed a difference of 2 pages. Sure, there are already a lot of cheap monochrome laser printer out in the market but come on, during these times of financial crisis, would you settle for a monochrome laser printer that only does one thing or the Epson WorkForce 600 which does not only print laser quality documents but can scan, copy and fax as well? For more information about the WorkForce 600 please click here. Here's another very positive review of the Epson Workforce 600.